Based in Brooklyn, NY, Phillip Stearns is the creator of the Year of the Glitch, a yearlong glitch-a-day project, and Glitch Textiles, a project exploring the intersection of digital art and textile design. He received his MFA in music composition and integrated media from the California Institute of Arts in 2007 and his BS in music technology from the University of Colorado at Denver in 2005. His work has been exhibited internationally at electronics arts festivals, museums, and galleries including: Turku Biennial 2013, WRO Biennale 2013, Transmediale 2013, Denver Art Museum (2013), The Photographer’s Gallery London (2012), The Camera Club of New York (2012), Eyebeam (2012, 2007), Harvestworks (2010, 2012); Gli.tc/H 2112; Festival De Arte Digital 2010; FILE 2009; NIME 2009; Filmer La Musique 2009; FONLAD 2009; Torrance Art Museum (2008, 2007); Optica Film Festival & (2011 2008). He has participated in residencies at the Making Lab of the 4th APAP ( Korea 2013), Textielmuseum in Tilburg, NL (2013), Institute for Electronic Arts (2012, 2013), Museums Quartier (Vienna 2010), STEIM (Amsterdam 2007, 2013), Experimental Television Center (2009), Harvestworks (NY 2010), Free103Point9 (2012). He has presented and led workshops at several international institutions including the Universidad De Chile (Santiago 2013), Santiago Maker Space (2013), Pomona College (2013), Recyclism Hacklab (Dublin 2013), and the Science Gallery (Dublin 2013). Electronic media operate primarily on only two of our senses: sight and hearing. Though I work with media technologies, electronics and electronic media, I tend to focus on condensing these in such a way that the technologies, tools, and media themselves become entangled with what would normally be read as the content or the message. As electronic media (digital or analog), images, video, and sound become reduced to signal—a manifestation of some order defined within a certain system—Light and Sound themselves become raw materials for reconstituting electronic signals back into physiological experience. Through deconstruction and reconfiguration the technologically mediated environment is approached as an assemblage, where human activity plays a role of equivalent importance to environmental agency. From this perspective, the development and application of our technologies, machines and tools reveals our perceptual biases, desires, dreams and fears—both conscious and unconscious. Cultural values and meaning, then, can be viewed as derivative, shaped by the situation of and the particular conditions facilitating the distribution agency through cascading exchanges of mediated interactions. Fragmented Memory is a triptych of large woven tapestries completed in May 2013 in Tilburg, NL at the Audax Textielmuseum’s Textiellab. The project uses digital practices and processes to blur the lines between photography, data visualization, textile design, and computer science. The result are works of visual art that serve not only to render visible the invisible processes mediating everyday experience, but also to operate as distinctly tactile and lo-fi digital storage media—the process becomes a means to capture, record, and transmit data. A snapshot of my computer’s physical memory was extracted in a core dump (using OSXPmem). Three selections of the binary data were converted to images using custom software written with the help of Jeroen Holthuis in Processing which grouped 6 bits into RGB pixel color values (2 bits per channel). The resulting 64 hues in the images were then mapped to a custom woven color palette created by mixing 8 colors of yarn using variations on a satin weave. The resulting patterns were then woven on a computerized industrial Jacquard loom. Because of the direct mappings from binary data, to image, and from image to woven pattern, it’s actually possible to decode the original binary data sourced from my computer’s physical memory. In fact, a key to the binding patterns is provided on the back of each piece. The assemblage of data in a computer’s physical memory serves as a record of human activity and agency, however abstracted and fragmented. By analyzing and understanding the data in a computer’s physical memory, it is possible, in some respects, to reconstruct a profile of the individual operating the machine. The physical memory of a computer contains the program data, instructions and file data, that are stored temporarily for future execution and processing. This includes media such as photos, video, sound, and text. In a sense the physical memory can be viewed as the part of a computer in which programs queue their instructions for the computer to execute. Those instructions once executed however, radiate, mediated back to the user, which brings into question the locus of agency in regards to who or what is programming or being programmed. Binary data can take on many forms: pits and lands in a thin film of metal, the alignment of magnetic domains on a metal platter, the presence or absence of charges on capacitive FET transistor gates, light and dark markings on a piece of paper, or different binding patterns in a woven textile. Each has it’s own materiality, physicality, scale, and temporal dimensions, as well as cultural significance. Early Jacquard looms used punch cards to automate the weaving of patterns and designs. Though not exactly programmable in the same way a computer is, the punch card technology from Jacquard looms was later adapted for use as a means for programming early computers and storing binary. With punch cards now a relic of the past and modern industrial looms controlled by computers, Fragmented Memory confronts us with the possibility of program machines using textiles. Perhaps it’s nothing more than a trick of language that digital copies are referred to as images. Maybe this is a remnant from a time before duplication became an invisible process of transcribing on/off states, when optics, lenses and mirrors, were necessary to reproduce the likeness of something in the world. To translate an image of computer memory to a visual form in such a way that the content of the data is preserved, an image of an image, and then to weave it into a tapestry somehow ties a clean knot. The patterns and designs locked in thread from the earliest times bear a striking resemblance to those formed by our digital machines today. ‘fragmented memory’, the triptych of large woven tapestries by brooklyn-based media artist phillip stearns uses digital practices to render invisible processes into tangible objects, a method operating as tactile and lo-fi digital storage media that can capture, record, and transmit data. 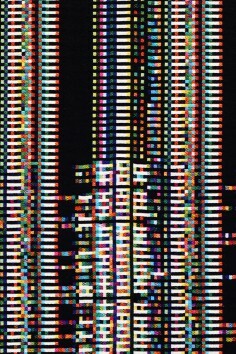 the project draws a snapshot of stearns’ computer’s physical memory extracted from a core system dump; three selections of the binary data converted into images using custom software which groups 6 bits into RGB pixel color values (2 bits per channel). the resulting 64 hues in the images are then mapped to a custom woven color palette created by mixing 8 colors of yarn using variations on a satin weave. the patterns are then woven on a computerized industrial jacquard loom. because of the direct mappings from binary data to image, and from image to woven pattern, it’s actually possible to decode the original binary information sourced from the computer’s physical memory.